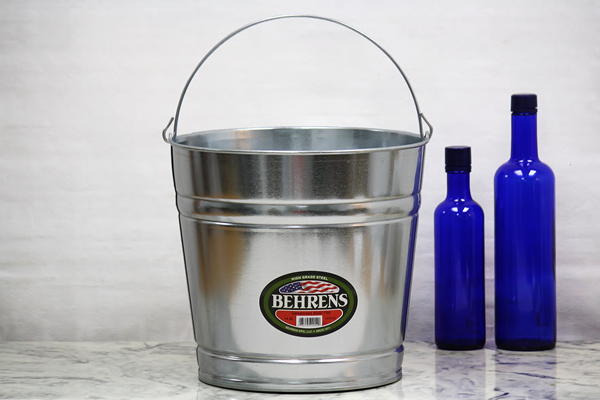 These large galvanized buckets are sturdily made and feature multiple body swedges, a reinforced wire rim, an offset bottom, and a nearly-unbreakable handle. Electro-galvanized steel provides these buckets' polished exterior, as well as resistance to elemental corrosion. They are a great size for transporting gardening tools, fresh vegetables, and weeds. You can also use these buckets to organize your linen closet by stocking them with small towels and washcloths. We also offer this bucket in 8 quart, 10 quart, and 12 quart sizes. See the more-durable 14 quart hot dipped galvanized steel style here.